A recent study by Anytime Fitness showed that more than 70 percent of Americans would rather go to the dentist, do taxes or sit in the middle seat of an airplane than go shopping for a swimsuit. Agree or disagree? I just got back from Laguna Beach, California, which explains why bathing suits are very much on my mind this week. Young and the not-so-young alike wore the teeniest, tiniest of bikinis everywhere, even in restaurants and on trams. As a mother, I was tempted to pull my husband’s shirt off on several occasions and wrap it around some scantily-clad teen whose bikini string threatened to pop. Fortunately, I contained myself, but one thing is clear; Nothing documents the mores of the times as much as bathing suits. 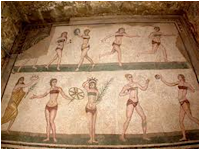 Two French designers get credit for inventing the bikini in 1946, but women wore bikini-like costumes for sports and public bathing as early as 1400 BC. After the fall of the Roman Empire, the church came into power and public bathing disappeared. 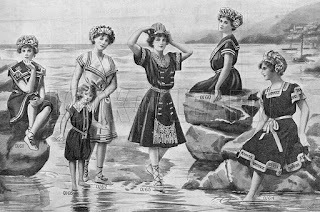 Two things happened during the Victorian age that was to have an impact on fashion; Railroads made the seashore a popular destination and women began participating in croquet, golf, bowling, tennis and other sports.The most controversial sport was swimming. Considered good for health, swimming also found favor for not causing women to do something as unfeminine as (gasp) sweat. But modesty and white skin took precedence over comfort and even safety. Any effort to make swimwear more suitable to the sport was met with opposition. As a result, feminine bathing suits were typically black and long-sleeved wool dresses were worn over bloomers. Black stockings, lace-up bathing slippers and a ruffled cap completed the outfit. Of course Victorians never left modesty to chance; for added protection weights were sewn into hems to prevent a skirt from floating up and revealing a feminine limb. indecent exposure. One woman in Coney Island was indeed arrested for merely wearing a bathing suit under her street wear. Men didn’t fare much better. In 1892 William B. Hemmenway of New York was arrested for swimming in a bathing suit that lacked sleeves. And, of course, strict rules forbade men and women swimming together as more than one hapless couple found out. Since some bathing suits reportedly weighed as much as twenty-two pounds, ropes were attached to buoys to give “swimmers” something on which to hold. 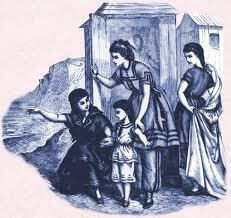 Bathing machines became all the rage in the mid 1800s. Invented by a Quaker in 1753, bathing machines contained a “modesty tunnel.” These little cabanas would be drawn into the water by horses and allow a female swimmer to emerge from the water in her dripping flannel or wool dress in complete privacy. This all changed in 1907 when the first woman to swim the English Channel, Annette Kellermen was arrested in Boston for wearing a one-piece form-fitting bathing suit. Considered scandalous at the time, her bathing suit helped pave the way for bigger and…uh…smaller things to come. I’m happy to report that the teeny-tiny bikinis weren’t the only ones creating a sensation in Laguna Beach last week; my “Mother Teresa” approved swimming suit got its share of attention. If only the looks of disbelief weren’t accompanied by shaking heads. It’s a good thing I left my hem weights at home. Today I'm giving away a copy of A Bride for All Seasons Collection, featuring Mary Connealy, Robin Lee Hatcher, Debra Clopton and me! So if you have an opinion on bathing suits, good, bad or indifferent, now's the time to speak up! *Gunpowder Tea (Brides of Last Chance Ranch) Can be ordered now! “Exquisitely intriguing" –PW starred review for GUNPOWDER TEA. lol My dad lived in Laguna for years. CA is pretty funny. You can go in the mall or stores without a shirt, without shoes, and you'll still get service. Jessica, I know what you mean. We are pretty funny out here. No shoes, no shirts, no problem! I love the post! Sure wish the swimmer of 1907 had worn capris and a tee shirt----my kind of swim suit! Melanie, thanks. It sounds like you and I think alike! What a wonderful post! Modesty seems to have been forgotten these days, especially at the beach! I love the Victorian swim weights and have wished for some before! Britney, sometimes I feel like such a prude. Those swim weights could come in handy, especially on a windy day. Ramona, extremes is right. There has to be a happy medium there somewhere, don't you think? I remember wearing a bikini for years when I was younger (8th gr. to 30 yrs. old) I'm surprised my mother or husband didn't tell me to cover up! I cringe when I see people in skimpy outfits (both men & women). I have become more modest with my suits lately. I was thrilled to find a pink floral (pink being one of my favorite colors) in a one-piece with an attached skirt that cascades down on one side. Martha, the cascading skirt sounds like something I would like! I wish more people made modest swim suits...I love that they used to wear Outfits and not something so small! I also would've like the tunnel to the water. =)Thanks for the history..and the chance to win. Hi Eliza! Can't send you a tunnel. Will a book do. Yep! That's right! Congratulations You won a copy of A Bride for All Seasons. Send your mailing address to me at margaret@margaretbrownley.com and I'll pop a book in the mail to you. That was a fun glance at history. My new favorite bathing suit (that I stole from my cousin) looks like shorts (doesn't show the squiggly jiggly top of legs) and a tank connected (doesn't let my chi chi's hang out)...so now I'm almost completely satisfied! Would love to read this book-my favorite authors wrote it!